Signed by famous maker, "Globe Wernicke of Cincinnati," a three section lawyer's bookcase also has a desk section. 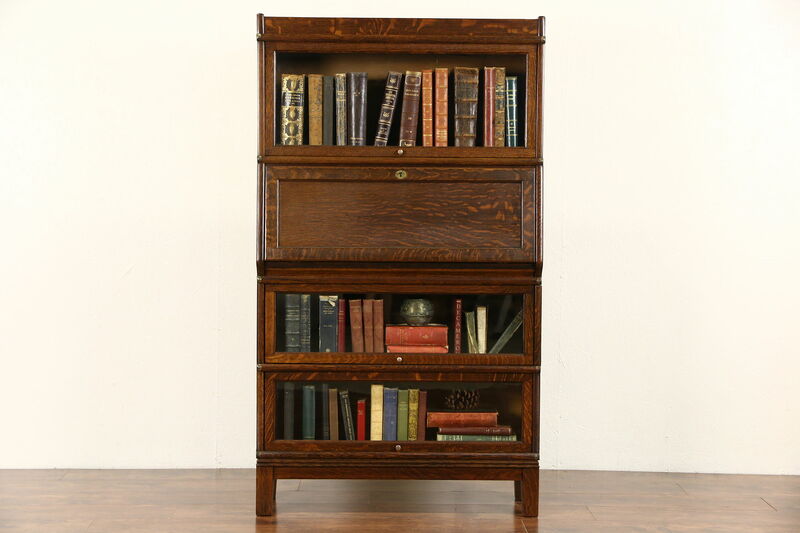 Quarter sawn oak has an excellent deep restored finish on this American made antique library or office furniture. The base and top are also separate stacking modules. The drop front desk has a working lock, inside are cubicles for papers. Glass doors have original wavy glass. The upper section fits books up to 9 1/2" wide and 12 1/2" tall, lower sections up to 8 1/2" tall. Measurements are 34" wide, 12" deep, 60" tall and the writing surface is 30" high.